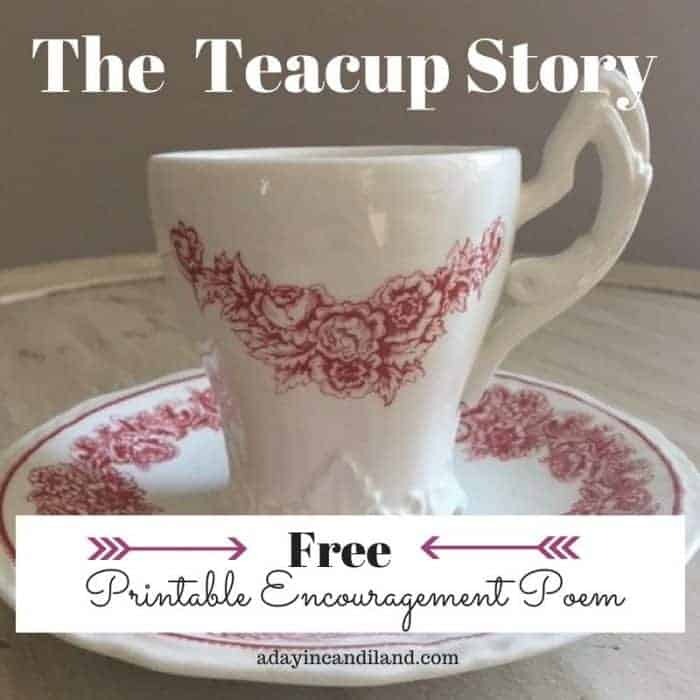 Enjoy this beautiful and encouraging Poem called the Teacup Story. Receive a printable copy below to print for your personal use. When I owned Teacups of Kindness (a teahouse), this wonderful Teacup story was posted on my website and we gave it to guests that came for tea. I have always loved this parable and wanted to share it again. You can get a free printable version of this story below. The author is unknown and the bible verse that correlates with this story is Jeremiah 18:6b “Behold, like the clay in the potter’s hand, so are you in my hand.” If you want other ideas for tea parties, visit my teatime page. If you are also looking for more encouragement printable scripture cards read this article. As the lady handed it to them, suddenly the teacup spoke. “you don’t understand,” it said. “I haven’t always been a teacup. There was a time when I was red, and I was clay. My master took me and rolled me and patted me over and over, and I yelled out, ‘let me alone,’ but, he only smiled and said, ‘Not yet.’ Then I was placed on a spinning wheel and suddenly spun around, and around, and around. Stop it! I’m getting dizzy!’ I screamed. “Finally the door opened, he put me on a shelf, and I began to cool. ‘There that’s better’, I said. And he brushed and painted me all over. The fumes were horrible. I thought I would gag. ‘Stop it, stop it!’ I cried. He only nodded, ‘Not yet.’ Then suddenly he put me back into the oven, not like the first one. This was twice as hot, and I knew I would suffocate. I begged. I pleaded. “I want you to remember, then’ he said, ‘I know it hurts to be rolled and patted, but if I had left you alone, you’d have dried up. I know it made you dizzy to spin around on the wheel, but if I had stopped, you would have crumbled. I knew it hurt and was hot and disagreeable in the oven, but if I hadn’t put you there, you would have cracked. MORAL: God knows what He is doing for all of us. He is the Potter, and we are His clay. He will mold us and make us, so that we may be made into a flawless piece of work to fulfill His good, pleasing, and perfect will. I hope you enjoyed this Teacup Story as much as I do. If you like it you can PRINT it below and please share it on twitter, facebook or pin it. The next time you have a tea party, you could read this story and it would be a great ending to your event. The word which came to Jeremiah from the Lord saying, “Arise and go down to the potter’s house, and there I shall announce My words to you.” Then I went down to the potter’s house, and there he was, making something on the wheel. If you enjoyed The Teacup Story, you may like these inspirational items. Get this beautiful encouraging teacup story printable when you subscribe to our weekly newsletter, where you will get encouraging tips for family, food, and more. Awesome! You are now able to receive our encouraging tips and stories. Don't forget to print your Teacup Story. Love this story, Candi! The next time I have a tea party, I'll be sure to read it to my guests! Thanks for stopping by. I find it a cute story to read and I usually get a good response. your welcome, thanks for stopping by. This is such a fantastic story. All tea cups have stories – don't they? I actually tell family story and history stories and encourage the women I have tea with to celebrate traditions about tea. So lovely! My recent post Milli Vanilli Blamed the Rain. Jamie Foxx Blamed the Goose. Lynyrd Skynyrd Blamed a Song. Thank you for sharing this story. As a believer in the Lord and retired minister I am clay being processed into His woman! On Nov 7, my church women’s group will hear this story while we are enjoying fellowship over a cup of tea. Were you able to get the printable? It should have been a download right after you clicked the button. If not I can resend. Signed up, how do I print the story? Wanted to use it at my tea party on Thursday. I signed up for the newsletter but didn’t get the printable. Can you send me info on how to print? Yes, I tried to print it as well. I have a Tea coming up soon. I just checked my downloads and didn’t find it. Can you resend? I can’t find the printable story ? So enjoyed it but can’t copy it ??? Left my info ,disappointed……….. I love that story. Having difficulty find the link to print. Maybe it’s my phone. Could you please email it to me? When you sign up, its an automatic download. It should be in your files. Thanks. No link available to print this lovely story. Can you send a pdf version? I was unable to find a link to print out the tea party story, even after signing up for your newsletter. Is there some way it could be sent to me? As a potter, I would really appreciate it. Thanks. Hi Janet, It is an automatic download, look in your taskbar or your download file. I hope you enjoy it. That is a beautiful story. I just know my Red Hat sisters will love to hear it next Wednesday at our monthly meeting. Thank you. This would be perfect for a children’s tea party. Thanks so much! I filled out name/email. & have not received a notice to download? Being from England and a believer in Jesus and His redemptive love for me, your story of the Teacup touched me. I have had epilepsy since I was 14; and God in His perfect love has been molding me for many years! I am now 67! Puts the words to Amazing Grace in a whole new light. A beautiful depiction of hiw much He loves us. I am sorry you are having trouble. I did not see that you signed up to receive the printable story. I tried to reply to the email you listed, but it came back as nonexistent You can try again with another email. As a lover of tea, tea cups and tea pots, and God’s word, this story blessed my heart and was a wonderful reminder that I am not my own; I belong to the Father who fashioned me for His purpose. Thank you for sharing Candi. I plan on having a tea for my WM ladies and this is what I need for the inspiration. Thank you so much. You have a lovely blog & I loved how this truth was set in this story. A tea store! How delightful! i bought the story and tried to download couldn’t neither could i print it. sharon pullum please help send me a copy to my email maybe i can print it that way. i need it for my mother’s day tea party at my women’s ministry on the 20th of may please ASP. sharonpullum@ymail.com i joined yours. please please help it so beautiful. Thank you *so* much for telling this parable. I’m 78, & have been in the Lord’s keeping all these years. This reminds me of a song we used to sing in Sunday school. I’m not positive of all the words, but it still “sings” in my head. I think it goes like so……“Have thine own way, Lord, have thine own way….thou art the potter, I am the clay. Make me and mold me, to thine own will, I’m waiting and willing, kneeling and still.” I haven’t seriously thought about the words in a long time! When I’ve had the “worst” happen in life, and can hardly even find words to pray, I’ve always sang this. Thank you for identifying what scripture it came from. Blessings!! !